Pop star Jennifer Lopez will feature in the official song for the 2014 World Cup in Brazil. Lopez follows in the footsteps of Shakira by working on a song for football's biggest tournament. The song "We Are One (Ola Ola)" was written by Pitbull, with the U.S. rapper also set to feature on the track. 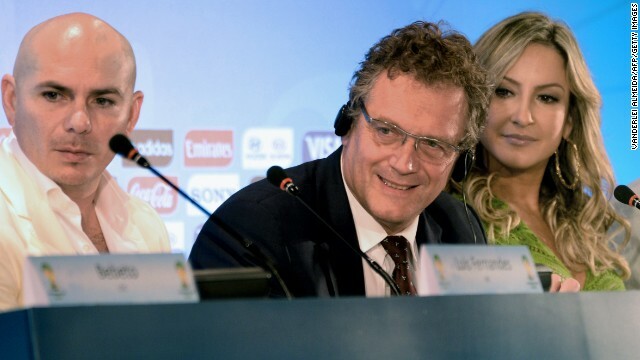 FIFA secretary general Jerome Valcke (center) officially announces the artitsts who will perform on the single, with Brazilian artist Claudia Leitte also set to feature. Pitbull, Lopez and Leitte will perform at the World Cup opening ceremony, which will take place at the Arena de Sao Paulo ahead of the tournament's first match between Brazil and Croatia on June 12. Los Angeles (CNN) -- "We are One"? Not quite. Singer Jennifer Lopez, who was supposed to perform the official song of this year's World Cup at the opening ceremony this week, has pulled out. "Regretfully Jennifer Lopez will not be attending this year's World Cup opening ceremonies," her rep told CNN in a statement late Sunday night. Lopez teamed up with rapper Pitbull and Brazilian star Claudia Leitte to record Brazil 2014's official song, "We Are One (Ola Ola)." With managerial changes taking place at Manchester United, Chelsea and Everton at the beginning of the season, as well as Tottenham getting in on the act last month, the stage is set for Manchester City to take advantage and reclaim the English Premier League title. Their free-scoring form at home has been frightening and it is now finally starting to pick up victories on the road to match. Serie A this season has arguably been more exciting and competitive than it has been for a long time. The arrivals of Rudi Garcia and Rafa Benitez have done much to boost Roma and Napoli's respective chances of landing the Scudetto, however, Juventus still remains the team to beat. 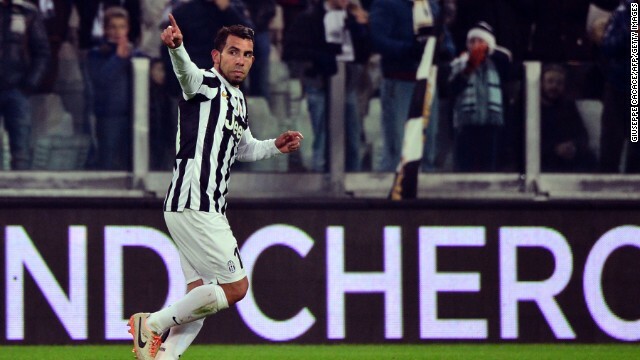 Searching for a third straight title win, the Bianconeri look as strong as ever following Carlos Tevez's arrival this term. Spain's La Liga is usually the tale of two teams -- Barcelona and Real Madrid. This time around, however, Atletico Madrid has also joined in on the act. Barca have managed to remain at the top alongside Atletico without playing to their full potential, yet come the second half of the season, expect their superiority to shine through. There are plenty of teams who will believe they have a chance of winning this season's Champions League, but it is hard to look past Bayern Munich. The holders broke record after record last season, completing a famous treble, and with Pep Guardiola -- who knows what it takes to win Europe's most prestigious club competition -- now at the helm, the Bavarians look capable of becoming even better. Zlatan Ibrahimovic, pictured, and Edinson Cavani should fire Paris Saint-Germain to a comfortable triumph in France's top division. The Qatari-owned club sits top of the pile heading into the new year, will fellow nouveau riche powerhouse AS Monaco steadily building up steam in second place. 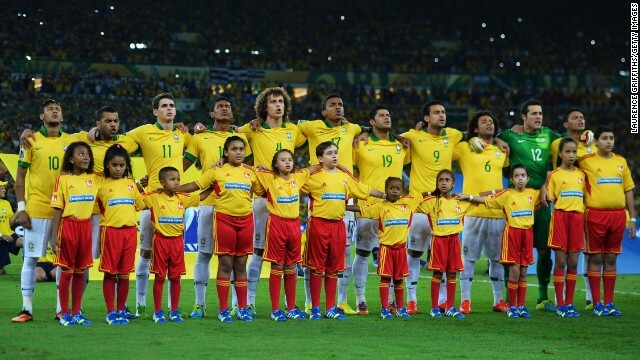 The pressure on Brazil to claim a sixth World Cup in their own back yard next summer is going to be enormous. But if the Selecao's impressive Confederations Cup win in June is anything to go by, not to mention the cracks starting to show in Spain's dominance, 2014 could well be Brazil's year. The trio was slated to perform at the tournament's opening ceremony ahead of the host's first match with Croatia on Sao Paulo on Thursday. The World Cup song has been a tradition since the 1966 World Cup in England, when a song dedicated to the tournament mascot, a lion named "World Cup Willie," was released. 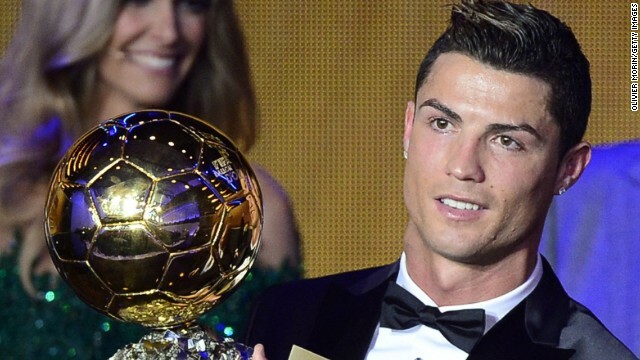 Cristiano Ronaldo raises the Ballon d'Or, after being crowned FIFA's best for the second time in his career. 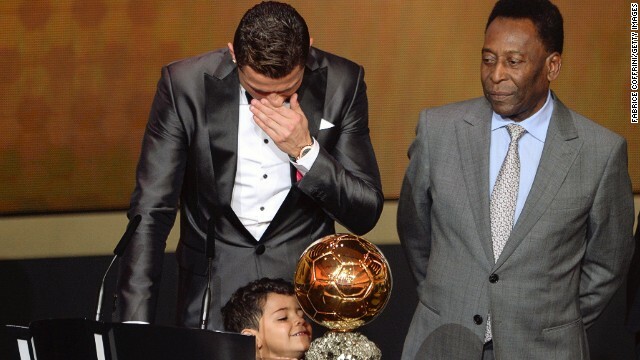 While the Portuguese star is overcome by emotion, his son Cristiano Ronaldo Jr cannot hide his glee at his father's prize. 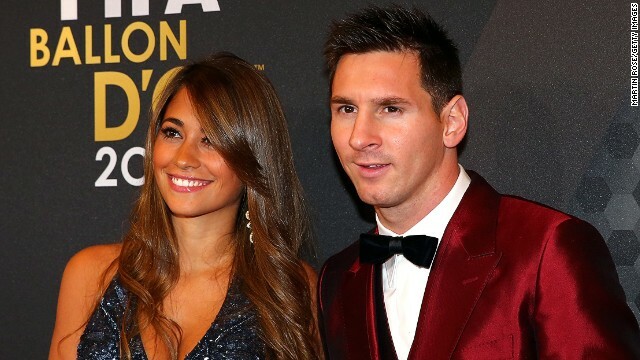 For the first time in five years, Lionel Messi - seen here alongside partner Antonella Roccuzzo - is no longer the world's best in FIFA's eyes. The Argentine, who scored 42 goals in 45 games in 2013, paid a price after suffering an injury during voting time. This was not a repeat of Zinedine Zidane's headbutt in the 2006 World Cup, but a warmer embrace as the Frenchman hands Bayern Munich's Franck Ribery his FIFA/FIFPro World XI award. Once tipped to win the main prize itself, Ribery eventually finished third despite winning five major trophies in 2013. 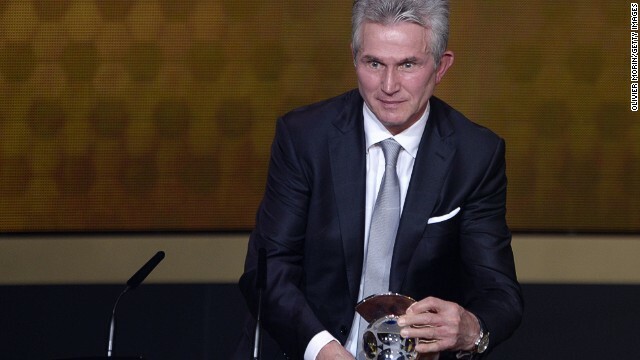 Now-retired Jupp Heynckes receives the Coach of the Year award after leading Bayern Munich to a Champions League, Bundesliga and German Cup treble in 2013. 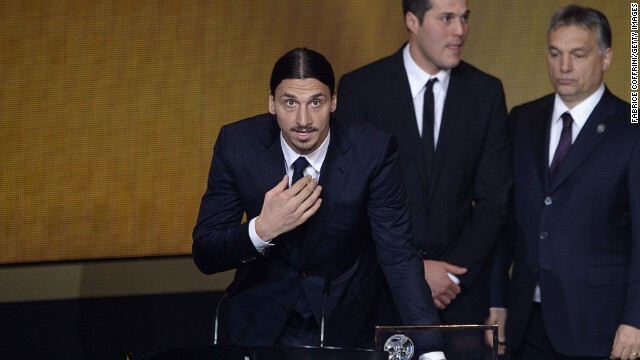 Zlatan Ibrahimovic addresses the audience after winning the FIFA Puskas award for best goal, with the Swede's overhead strike against England deemed better than efforts by rivals Nemanja Matic of Serbia and Brazil's Neymar. 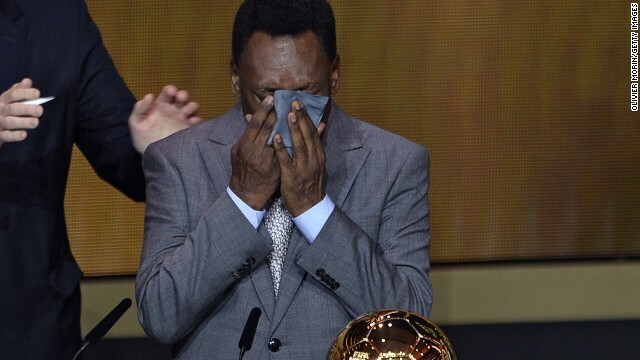 Brazilian legend Pele cries as he is handed an honorary FIFA Ballon d'Or, with the three-time World Cup winner having been ineligible to win the award during his playing days because he did not play in Europe. 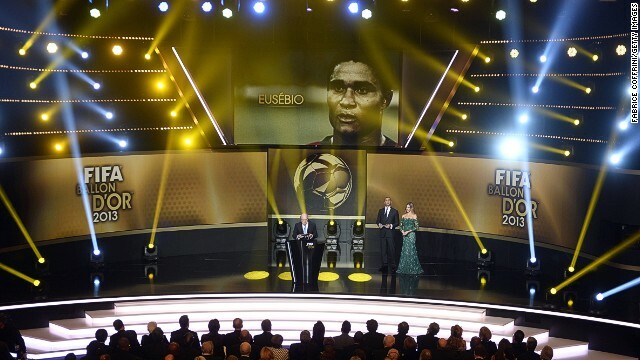 FIFA president Sepp Blatter speaks during a tribute to the late Eusebio, with the Portuguese forward -- who died earlier this month -- having won the Ballon d'Or in 1965. 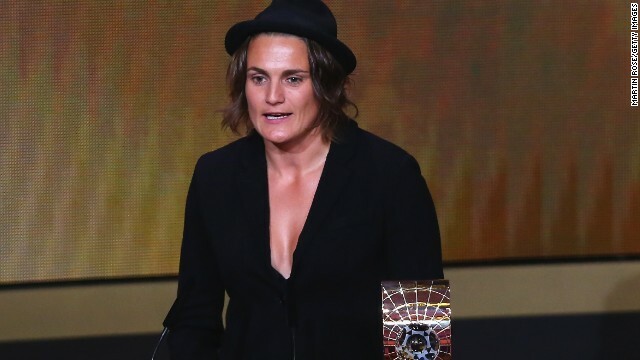 Having saved two penalties in a 1-0 win over Norway in the final Euro 2013, German goalkeeper Nadine Angerer was crowned the best women's player in the world ahead of Brazi's Marta and American Abby Wambach. She becomes the first goalkeeper to win the female crown. Former Dutch footballer Ruud Gullit and Brazilian actress, model and TV presenter Fernanda Lima compered the evening at the Kongresshalle in the Swiss city Zurich. Another Brazilian -- three-time World Footballer of the Year -- Ronaldo was also in attendance, alongside girlfriend Paula Morais. The former forward now works on behalf of Brazil's 2014 World Cup committee. 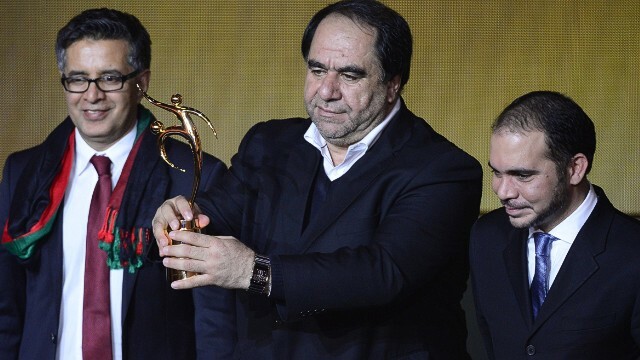 Afghanistan Football Federation president Karim Keramuddin receives FIFA's Fair Play award after his nation staged its first home international in 10 years. Played in August 2013, the game ended with the hosts beating Pakistan 3-0. Four years ago, it was Shakira telling the world to "Waka Waka" ahead of South Africa 2010. Soon after the song was released, Pitbull, who has previously worked with the likes of Christina Aguilera and Enrique Iglesias, spoke of his joy at being involved in the project. "I'm honored to join Jennifer Lopez and Claudia Leitte at the FIFA World Cup to bring the world together," said Pitbull. "I truly believe that this great game and the power of music will help unify us, because we are best when we are one." Keep track of the social buzz at Brazil 2014 with CNN's Facebook Pulse -- find out who the world is talking about. It needed 120 minutes to separate the best two teams on the planet, but Mario Gotze's sublime strike gives Germany a fourth World Cup title. After 64 games, some huge shocks and 171 goals scored, now it's time to play fantasy football -- who would you pick in a World Cup dream team? Germany won the World Cup, but these stats suggest that the host nation came top of the table at Brazil 2014 -- despite a crushing semifinal defeat. Bare bellies, an on-pitch streaker, world leaders and superstar selfies -- the World Cup final had it all. Having crushed home hopes of success, Germany prevents Brazil's worst nightmare by beating the World Cup host's South American rival in final. One of the joys of watching the World Cup is seeing relative unknowns come to the fore. Here are 11 players to watch at Russia 2018. 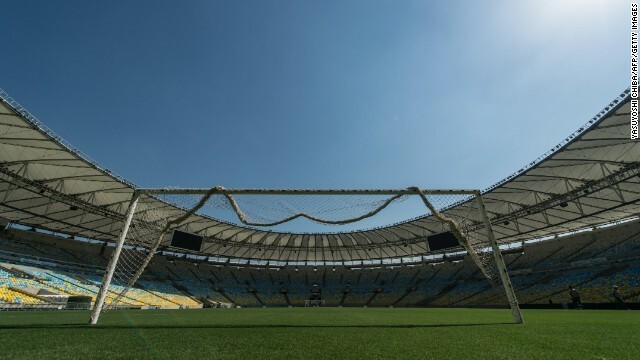 Stay informed with results of the latest World Cup matches and the full schedule for the month-long tournament in Brazil. In the sight of Rio de Janeiro's Christ the Redeemer, the man who would be king awaits his destiny. Germany's semifinal demolition of World Cup host Brazil in Belo Horizonte is the game that seemingly everyone can't stop talking about.